Dusseldorf-based events agency Hagen Invent has won a pitch to manage the 8th International Audi Twin Cup event for the car manufacturer. 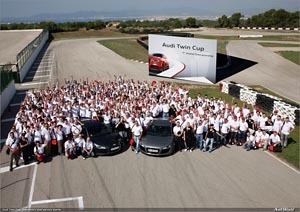 The event, which will take place in July in Western Europe, is the culmination of a year-round contest for the service and technical staff of Audi partners from across the world. Around 500 of the top-performing international service and technical teams from the Audi dealer network from 47 countries will compete in a final for the titles of 'Service World Champion', 'Technical World Champion' and 'Twin World Champion'. The three-day event will culminate in a gala dinner and awards ceremony. Hagen Invent previously worked with the car manufacturer on its International Dealer Meetings in 2010 and 2011 in Barcelona and Monaco, and will also manage this year's meeting, taking place over three weeks in a major European city. Separately, the agency recently secured a pitch to run a two-week event for Volkswagen, which will be attended by more than 4,000 service consultants. Hagen Invent also worked on the Volkswagen Cabrio Days event in Dresden last year, for 2,000 directors and managers from Volkswagen dealerships.